Firehawk… Firestorm’s sometimes partner, sometimes love interest. She’s a compelling character and played vital roles in Firestorm volume II and volume III. We’ll be looking at this character more over the coming weeks. Today we’ll be focusing on her various costumes. 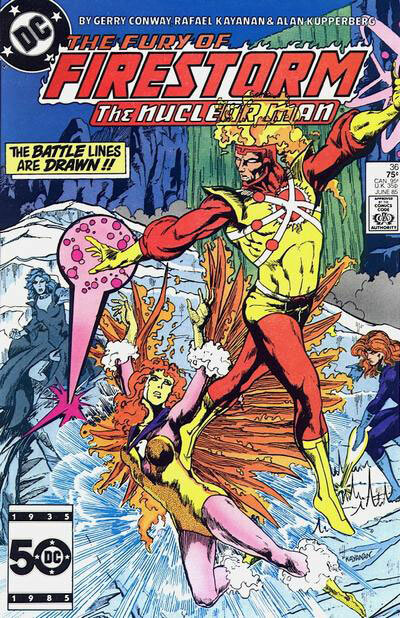 When Firehawk first appeared she had been brainwashed into attacking Firestorm. You can see in her first appearance below the aggressive posture and facial expression. 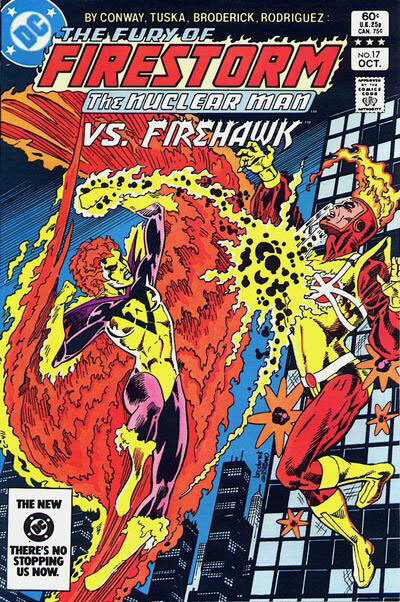 Also notice the similarities between the costumes of Firehawk and Firestorm. Both have the yellow gloves, boots, and body suit; both have the flaming hair; and where Firestorm has red sleeves and legging, Firehawk has pink. Overall, very similar. Firehawk quickly became a supporting character in the book. You can see in the cover below the artists began to soften her costume, moving away from the aggressive appearance above. It doesn’t really constitute a costume change, but the subtle differences give her a more friendly appearance. Firehawk got her first real costume change in Crisis on Infinite Earths #8. While on the derelict JLA satellite, Firehawk’s original costume was destroyed when the Red Tornado exploded. In a bizarre moment that still doesn’t make sense, she created a new costume for herself stating that, “When you have molecular reconstruction powers, whipping up a new suit takes hardly any effort at all.” The confusing part is that she doesn’t have molecular reconstruction powers. In an effort to make sense of the scene, I tried reading it as if Firestorm had created the suit for her with his powers. Nope, the scene doesn’t work that way. Perhaps the confusion happened because another writer was handling the character in Crisis. In regard to the costume itself, note that Firehawk changed the color of her flames from orange to light blue. The flames and the asymmetrical hawk pattern really created a neat look for her. Finally, here is Firehawk’s current costume. This is how she looked during Firestorm volume III. This costume was designed by Jamal Igle. Notice she kept the light blue flames, but now her skin color has changed and she has pointed ears. I don’t believe they ever explained the pointy ears, but that combined with the shorter hairstyle gives her a cute pixie-like look. Personally, my favorite costume is the second one. It’s a really interesting design and helped to set her apart from Firestorm’s look. Watch this space for more on Firehawk coming soon! Posted in: Comic books, Firehawk, Firestorm comic vol. II, Firestorm comic vol. III. I personally LOVE the visual of the CoIE costume, but having tried to draw it, easily understand why Igle made the switch. 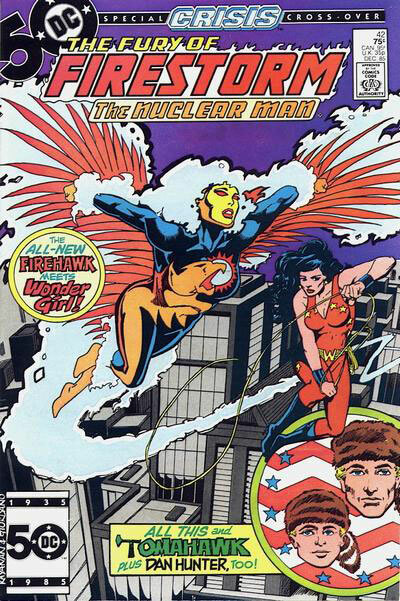 Firehawk is one of my favorite charcters, regardles sof her ties to Firestorm and I find it uncceptable that she hasn’t at least had a chance to shine in at least a one-shot of her own. Doug – I couldn’t agree more that Firehawk deserves more time in the spotlight. I was really pleased to see her featured somewhat prominently in the first issue of “Identity Crisis”. She was hanging out with Elongated Man through much of the book. I liked that Firestorm wasn’t around for those scenes, so she wasn’t forced to be in his shadow. I read some Firestorm fan fiction a few years ago that featured Firehawk as part of the JLA (but Firestorm wasn’t part of the JLA). Even though it was fan fiction, it was cool to see her operate independently from Firestorm. I have never been a fan of Firehawk but between the costumes you showed here I like the 2nd one the most. Actually, Lorraine made her first costume by molecular restructuring of the containment suit they had her wearing when they exposed her to the reactor. 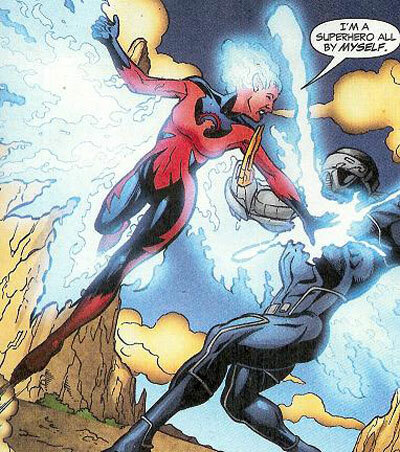 So I think it should be accepted that Firehawk likely has the same power set in principle as Firestorm, just stronger in some areas (heat/flame generation) and much weaker in others (or less aware of potential in them — like transmutation and likely molecular vision). Both are likely able to augment/repair their own structures depending on focus (I believe we’ve seen Lorraine take some things no normal human body would bounce back from). My personal thinking is that Firehawk can only affect molecules of herself or those she is touching, hence why this usually only manifests in her appearance changes/costumes. I brought up the pointy ears to Jamal Igle on the DC Comics Message Board a few years ago when it came out. He defended it on the basis that it just looks cool. I pointed out that Lorraine is a human and pointy ears should be reserved for devil characters or aliens. Jamal Igle said, yeah, but it looks so cool. I pointed out that there’s no reason for them because comic-book nuclear energy gives you nuclear blasts or nuclear heat or transmutation powers or whatever, but they don’t make your ears pointy. And he said, dude. They look cool. And that was that. You could update this and ad pics of super-cute Therese.